How often do we deal with money? Every day and even every minute. That is why the today's world offers us lots of different payment options, from traditional ones to newly created. E-wallets are the new and alternative payments options; nevertheless, they are sometimes even more popular. It can be easily explained by the simplicity of their use and no hassles in money transactions. 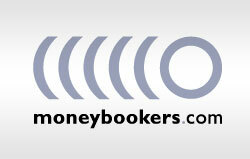 MoneyBookers is an alternative online payment solution. It makes all the financial transactions in a real time manner and is an appropriate solution for any kind of online business due to the high speed of money transferring. Moneybookers allows its users to register easily and transact funds having an e-mail address only. It is a good option for shopping online, funding online casinos, depositing and withdrawing money. The most important issue is that customers do not need to reveal their credit card information when paying merchants via Moneybookers. The account opening is very easy and takes a few minutes of your time. But pay attention to the rules and policies of the Moneybookers company placed on the website, so that avoid problems in future. Moneybookers personal account allows its owner to make transactions quickly and safely due to the latest software usage. Personal data of accountholders is securely stored with the help of modern encryption technologies. When Moneybookers account is funded it can straight away be used as online casino banking. Moneybookers does not attract its users by offering them unreal benefits. It is providing high quality services without too much fuss about it. Moneybookers ensures to provide all transaction with total security and privacy. Despite many advantages, Moneybookers does not always get pleasant reviews. The complaints mainly concern the problems when opening and funding account. They are true if user do not read instructions attentively or skip some of the rules. Another complaints are issued because of the problems with money withdrawing. More complaints concern low quality of customer support service. Nevertheless, Moneybookers has more than 5 millions clients all over the world, but its service is unavailable for US residents.